While treatable, chronic obstructive pulmonary disease (COPD) remains the third leading cause of death in the U.S., according to the American Lung Association. 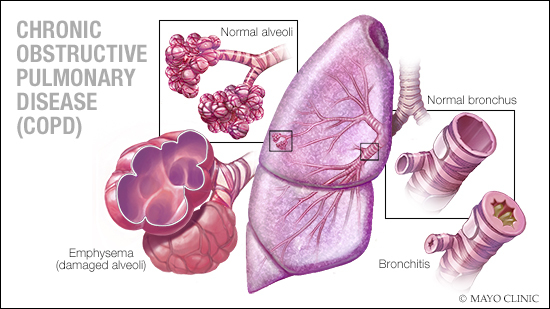 COPD is a chronic inflammatory lung disease that causes obstructed airflow from the lungs. Symptoms include breathing difficulty, cough, mucus production and wheezing. COPD is a progressive disease caused by long-term exposure to lung irritants, most often cigarette smoke. People with COPD are at increased risk of developing heart disease, lung cancer and various other conditions. November is COPD Awareness Month. On the next Mayo Clinic Radio program, Dr. Paul Scanlon, a pulmonologist at Mayo Clinic, will cover COPD treatment and prevention. Also on the program, Dr. Alice Gallo De Moraes, a critical care specialist at Mayo Clinic, will explain the dangerous and sometimes deadly illness, sepsis. And Dr. Eric Green, director of the National Human Genome Research Institute, will give an update on advances in human genome research.